A hardware shop that sells everything. Well, seemingly everything - shelves stretch from floor to ceiling holding almost anything you could possibly want, at sensible prices, and all within the constraint of one shop unit. Pet food? Can openers? Graters? Plant pots? Ant powder? Toilet seats? Pyruma fire cement (of all things)? Yes, they stock it. 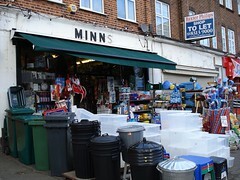 Minns has been around for as long as Nick can remember - the shop cat died a couple of years ago aged 21, so it could well have been trading for over 25 years. Last visited by Nick, 12 May 2008. Last edited 2008-12-21 22:21:59 (version 2; diff). List all versions. Page last edited 2008-12-21 22:21:59 (version 2).